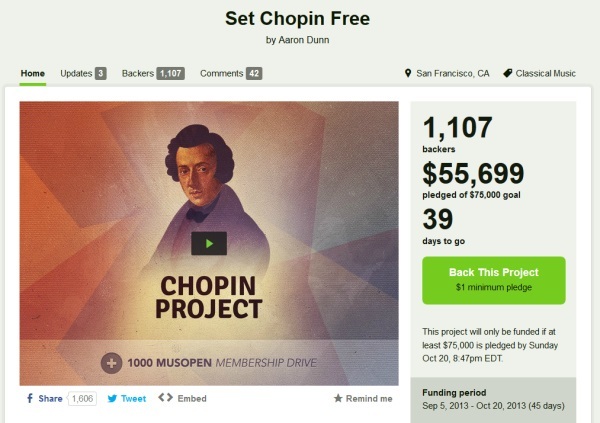 Met de kickstarter campagne "Set Chopin Free" wil de non-profit organisatie Musopen het volledige oeuvre van Frédéric François Chopin (1 maart 1810 – 17 oktober 1849) beschikbaar in het publieke domein. "Musopen (www.musopen.org) is a 501(c)(3) non-profit focused on improving access and exposure to music by creating free resources and educational materials. We provide recordings, sheet music, and textbooks to the public for free, without copyright restrictions. Put simply, our mission is to set music free."